A traumatised ex-soldier, desperate to leave his past behind, is stranded on a space station with six strangers, his memory wiped. To escape, he must learn how to work with the others, uncover how he came to be there, and how he can survive. Only to discover that his one chance of freedom has already been cruelly stolen from him by the woman he loves. He realizes that true freedom can only be gained by sacrificing his desires, confronting his demons and ultimately letting go of the past. 'glorious' is a science fiction, Gothic horror screenplay. It is a reworking of my 1999 & 2002 screenplays. The original versions met with some success but ultimately failed to find a home. The plan is to develop it into a viable, commercial property. 2000: Long short listed in the Orange Prize for Screen Writing & Pathé Production Prize 1999. I have a fetish for this. This is the kind of idea that commands attention. There are plenty of emotions on display. This is a good setup for a mystery to unravel in eerie ways that pit the crew against each other, forming teams and competing motivations. The Wraith-Sachs-Green love triangle… a half-sibling rivalry that spans most of their lives… an interesting diversion from a main plot creating tension and driving the main plot. There is one thing that makes this: a supernova. This is something only seen a few times in human history, never up close. Putting a tense plot right next to one of the biggest ticking clocks in the galaxy is a proportionally strong pacing device. The climax, the actual supernova, reads as exciting, blockbuster sci-fi visuals. With group character drama taking center stage, the dialog is the sole carrier of the scenes. Credit must be given to the dialog for not getting bogged down in exposition. The sci-fi genre generally requires a great deal of exposition, but this script actually manages to avoid it. What specifically went wrong to <redaction> is never bluntly stated - the audience can still glean that <redacted> for a catastrophic reason. Enough praise can’t be given to the concept. The concept is golden. There’s an interesting premise and setup building to an inevitably exciting climax. A sequence of events, actions, and decisions from a well established emotional perspective. As far as first drafts go, this one is in good shape. Bemused to find themselves stranded on a space station orbiting a dying sun, without any recollection of who they are, crew members try to piece together the mystery. As they explore their surroundings, they begin to have group memories that inform them about their situation. On the eve of making scientific history with their research into the neighbouring supernova, a combination of ego clashes brought about their downfall. Fighting against time as the sun is about to explode, <redacted> only just manage to leave the doomed station before it blows. This is a very ambitious idea. There are certainly some interesting themes at work. The concept of amnesiacs piecing together a troubled past is always intriguing, and I like the way the narrative unfolds through revisited memories. The love triangle brought a much needed human element into the piece. Each character has their own human failing that contributes to the breakdown of the mission. The premise is established quickly. There is a sense of crescendo towards the end. The description of the sun exploding... is beautiful. I have to admit that sci-fi isn't to my taste, meaning that I may have struggled to understand this story more than an ardent fan. A good narrative accessible to anyone, regardless of the content. There is definitely an interesting idea at play here. This is a script laced with twists and tums, layered with <redacted> references. The basic premise shows a group of people stranded in space together. Their coping mechanisms, survival instincts and quest for escape are under scrutiny. As they begin to remember the reasons that brought them together, they leam that old habits die hard. The conflicts or the attractions of the past creep up on them. This raises interesting, provocative questions, such as can old traits be replaced by new ones or can you learn from hindsight and do you get a second chance? The structure of the peer group is well defined, the dynamics of the group are both convincing and plausible. The three acts are clearly defined. The strength of this script is in its original premise, the way people function collectively through and despite adversity. Perhaps there are too many hidden messages, or <redacted> references. Presently the writer seems to focus on whether the audience has got the clues he has left behind. We soon discover that the scientists represent <redacted>. This is done well and subtly. The most natural of the characters is Sachs. She seems to be the only character that emotionally reacts to the strangeness of the situation. Her fear and anxiety therefore is plausible. The writer has an obvious understanding of how to tell a visual story. He has a clear direction and vision of how he wants the audience to see this story, which has been finely choreographed. The use of flashbacks has been well crafted and would probably be better seen than read. The dialogue in the script is convincing. The writer has given each of the characters their own distinct voices, allowing us to distinguish one person from another. The script has a clear pace running throughout. The writer successfully varies it, for example building up the pace to create tension when the scientists are searching the space station, or slowing down the tempo during the love scenes between <redacted> and <redacted>. This works well and helps to engage the audience with the story. This again is a tricky one. Technically this screenplay may be difficult though not impossible to achieve. The special effects needed for the many astronomical shots may create a problem. But as the writer suggests <redacted> may be an appropriate location for the space station and would be the only location needed. This film could be achievable on a low budget. Science Fiction films generate a wide appeal. This script deals with issues that are central to the human condition, e.g. 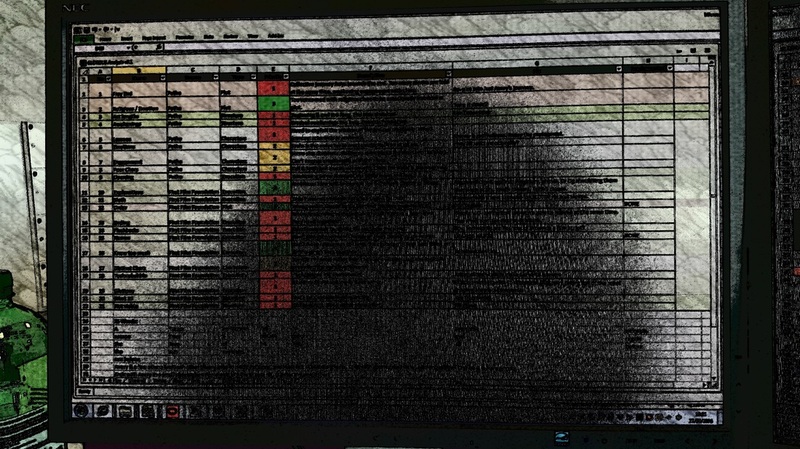 survival and <redacted>. It taps into emotions familiar in most of us, allowing an audience to recognise elements of themselves within each of the characters. This script has much potential. Although we enjoy looking out for the clandestine messages, they do not serve a purpose. Once this is rectified, the potential already in the script would be greatly enhanced. 23-June 2016 Glorious v3.0 draft completed & shared for review. I'm now free to start work on LMOE v3.0! 15-June Glorious: I've written Act 3 in a lot less time than expected, 'cos it's a lot shorter than I planned! I need to revisit it (from page 96 on wards). That is now a 106 page draft v3.1 version COMPLETED. (I just have to go back and a two tiny scenes I missed.) At home I wrote a whole new finale scene then had to shorten the last Act accordingly. 09/05/15 Finished the character arcs, decisions and lessons learnt. This was fun. 08/05/05 I finished all of the small details of the character design, except for two minor characters, but I can work those out as I go. 06/05/16 I worked out exactly what each character thinks based on their allegiances and motivations. I also extensively explored re-working the structure and order, but eventually arrived at a new character driven, rather than plot driven, reason for the structure. I then expanded the ending - I can't wait to write it! - then worked on some imagery & symbolism to be included. 05/05/16 I completed plotting Acts 2b & 3 including the ending. I worked far, far too late into the night. 04/05/16 I worked out something called the '3rd Act Solution' which goes at the end of Act 2b. I worked out an acronym for the name of the space station, as well as a new minor motivator for the protagonist. Finally, I changed the pitch text that describes the story. 02/05/16 Finished plotting Acts 1 & 2a. It was like pulling teeth. ​21/04/16 Glorious: I've spent the whole week expanding my knowledge of the characters and their interactions. Pretty technical stuff really. 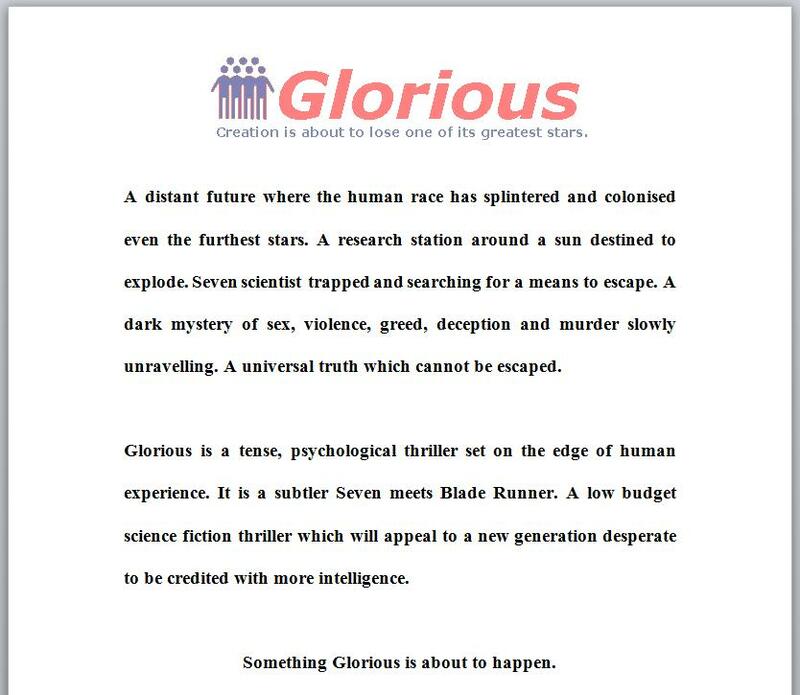 16/04/16 Glorious: I've spent a few days brainstorming the character back stories for 'glorious'. Some interesting stuff came out. I then worked on the relationship each character has with the protagonist, like protector, believer, thinker, feeler, doubter, moral compass etc. I also worked on 'the unity of opposites'; the minor character 'spats' that mirror the main hero and villain tussle and help to add conflict and texture. 12/04/16 Glorious: While enjoying a few days away in Devon, I completed the first step to rewriting my screenplay 'glorious'. I finished a scene by scene, page by page analysis of the last draft I can find, v1.0 from 1999. I know for sure that there were subsequent re-writes, including a major 2002 re-write, but I just can't find them. I can see what's wrong with the original script, but correcting it will be a long, arduous task. 09/04/16 Glorious: I had some professional coverage of earlier versions of the script by a few production companies in 1999 and 2002. The first step was to analyse the constructive criticism I received, to make sure I incorporated the valuable notes into the new version I'm about to write (v3.0). A future soldier has to overcome amnesia, escape from a distant moon and regain the love of his life, all before the sun explodes. Creation's about to lose one of its greatest stars.